← Custom Loma Wheels – Installed! A few week-ends ago, a friend and I had in mind to take pictures of my new paint + wide body combination. Off we went! We had 2-3 places in mind and since the first spot turned out very busy, we turned around in direction of the second one. As I was driving the TT, my friend and I had a discussion about how it would be nice to shoot the TT in a quarry / mine or a place of that nature. I knew of a similar place a just a minute away and we were driving towards it! So that was it, the local excavation pit was our next stop. As we turned in, there was this huge pile of scrap metal on my left… It’s the only thing I was seeing, we had to stop. So I parked the car about 20 feet away and started walking towards it. Right away, lots of images came to my mind. At first, it made me think of two movies: Christine and Transformers. As I was getting close, I was struck by the contrast of old scrap metal parts, some made of the same metal that the TT is made of. 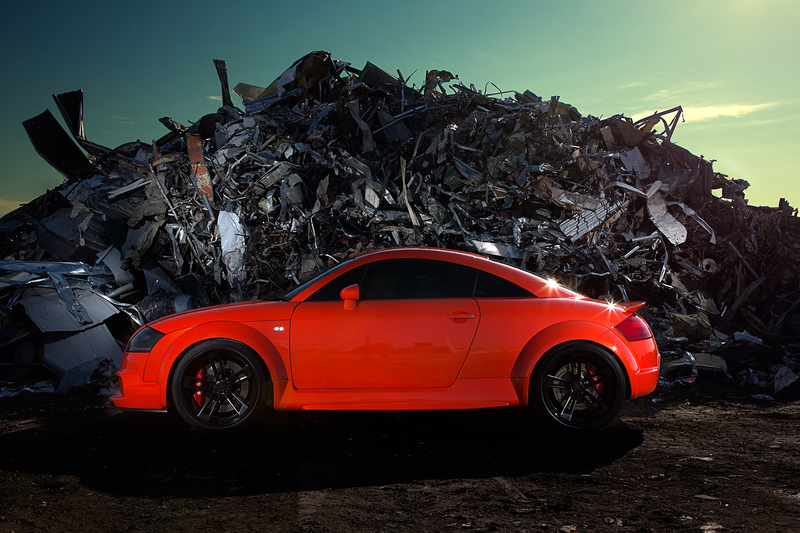 Kind of a before and after thing, where the TT, in many years from now will also become scrap metal… Beauty and the beast. Anyway, you get my draft. When I was finally just next to it, I realised that the ground was filled with screws, nails, sharp metal parts… Ready to punch holes in my brand new tires! So we very slowly brought the TT to the base of the metal pile, making sure we were taking “most” of the sharp parts in its path. Here’s the final result. I believe it’s simply incredible and if you look at it in an artistic way, you’ll see more than just a nice wide body TT. The photo was not modified with any software, this is it. We only used good flashes. Wow Andre you did it! Hobbs, This picture blew my mind away that I had to use it for my desktop. Awesome idea..Orange is my favorite color! !